Blistering performance and hot rod style combine in the radical VRSCA V-Rod, introduced as the first member of a new branch of the Harley-Davidson motorcycle family. The V-Rod is Harley-Davidson’s most powerful production motorcycle to date, boasting the high-revving, liquid-cooled, 115-hp fuel-injected V-Twin Revolution engine. Long, low lines evoke images of drag bikes with kicked-out front forks; a low, sleek profile; and gracefully upswept exhausts. Propelled into motorcycle stardom by an enthusiastic public and press, the V-Rod garnered more than a dozen international and American awards soon after its launch. 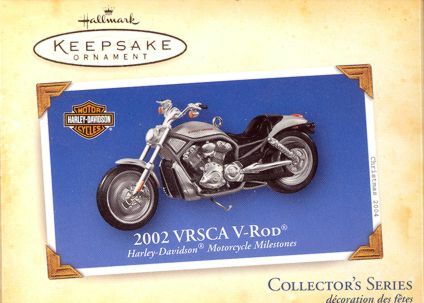 This Keepsake Ornament is based on the V-Rod with anodized aluminum bodywork.